Writer Chuck Palahniuk returns to the mayhem with Fight Club 3, a new comics series coming from Dark Horse on 1/30 that continues the sordid misadventures of the original book’s narrator, who now goes by Balthazar. The author’s got most of his Fight Club 2 team with him too — line artist Cameron Stewart, letterer Nate Piekos and cover artist David Mack. Joining them is colorist Dave McCaig. To whet your appetite, Palahniuk’s written a short essay ruminating on the series’ themes that will be published in select Dark Horse titles starting this week. But since we know how impatient you are, we’re presenting it you first as a 13th Dimension EXCLUSIVE. Buying a sofa does not make you a grown-up. No more than getting married cures your psychosis or having a child resolves the boozing and drugging you’ve done to self-medicate your immaturity and mental illness. Still we do it. We go through life like the squares on a board game. Roll the dice. Go to school, high school, college, trade school. Collect licenses, diplomas, paper money. Get married, buy a house, have kids, get a job, get a job, get a job. Retire and so on. Then we marvel how it all passed so quickly. Sometimes the best thing that can happen is a road block, a detour, anything that thwarts our good kid’s dot-to-dot foot race from so-so childhood to funeral home. 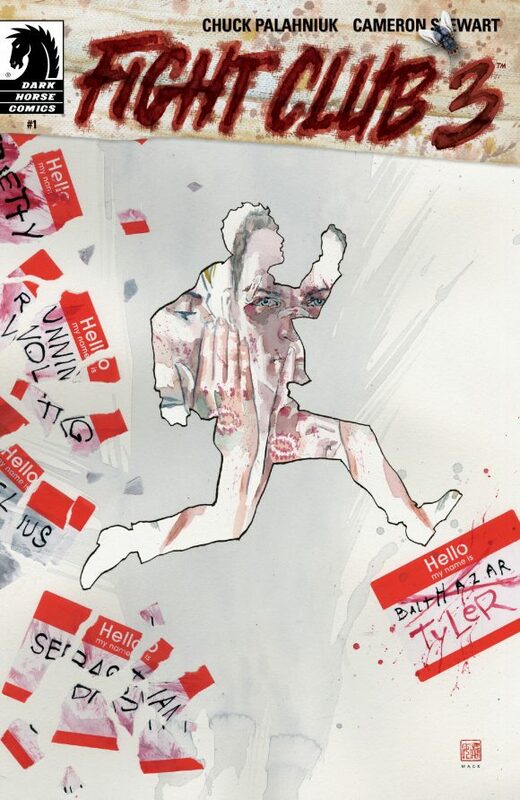 In Fight Club 3, Balthazar (formerly Sebastian, formerly Running Wolf, formerly no one) creates his own fresh mayhem. Unknowingly, he hatches another something that just won’t allow him to play by the rules. Even now that he’s hit bottom – with no job, a neglected kid, a pregnant wife, and living life in a crack den motel – he still has a long way to fall. Whether he’s aware of it or not, he’s sabotaged his own happiness because something bigger is possible. Something bigger than the dreams we aspire to in childhood is always possible. Reality is always larger than reality. And this fresh detour will bring about his biggest disaster to date. Also, perhaps the biggest redemption in all of creation. The result of a celestial plan set in motion before humankind was created. No, Tyler Durden isn’t the villain. Tyler’s the only wingman who can help Balthazar rescue himself and his family. Or not. As always Tyler has a plan of his own. Who says you can’t teach God anything…? — Confessions of a Failed Saint, by CHUCK PALAHNIUK. Click here. — CHUCK PALAHNIUK: What’s Next After FIGHT CLUB 2. Click here.